I'm toying with the idea of building a 29er single speed demo frame with a belt drive system from Carbon Drive Systems. The trick is creating a breakaway frame component that allows the belt to slip through during installation and/or removal for servicing. 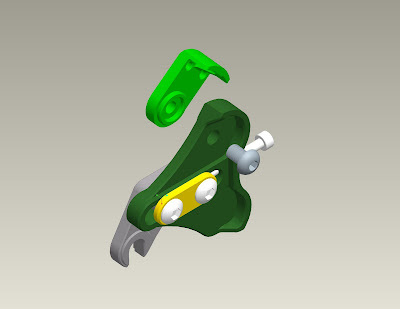 For a quick-and-dirty prototype, I'm going to modify a sliding dropout assembly as shown in the images below. 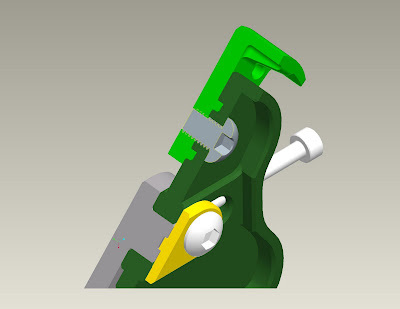 The back side of the dropout body will have a circular machined recess to accept a seatstay attachment; this attachment can pivot around the hood's centerline to accommodate for different frame sizes more easily. The mating parts are held together with an M8 screw that will be torqued down with blue Loctite. I may opt for an even shorter seatstay component that 'nests' directly with the adjacent hooded surface on the sliding dropout body. Belt driven bikes are fun to ride and offer another reason to try something new.